I am not a vegetarian (obviously), but it wouldn’t do not to try a vegetarian restaurant now and then. I have many vegetarian friends and they always lament the lack of good vegetarian restaurants around the shop. Moreover, they lament the lack of vegetarian options in most restaurants, which usually limit their choices to pasta or risotto. So Vanilla Black, which has been on my hit list for a while now, seemed to be an interesting choice for my first veggie write-up. All the more so when you consider that their approach to vegetarian food, as explained on their website, “is not that of vegetarian in the traditional sense, but rather a passion for meeting the challenge of cooking without meat or fish”. So I went along to Vanilla Black with some veggie and non-veggie friends to test how well they would meet this challenge. First a word on the menu (2 courses for £24, 3 courses for £30). Obviously with a lack of meat protein in vegetarian food, it is necessary to make up for this in other ways. The menu seems to adopt a reasonable approach to this, with all dishes incorporating at least one type of protein, and some dishes incorporating at least two types. This latter point got the nod of approval from my vegetarian friend. We were first served an amuse bouche of tomato and celeriac cocktail. I think this would have been very nice, but for the fact that it was extremely salty, which killed the taste of the tomato and celeriac. Therefore it was slightly unappetitising. A starter of baked beetroot terrine and horseradish cream with orange oil and fennel salad yielded a nice kick from the horseradish, which was not too overpowering. The fennel had been nicely cooked to keep its firm texture, but again the terrine itself was a little too salty. Otherwise it would have been quite tasty. 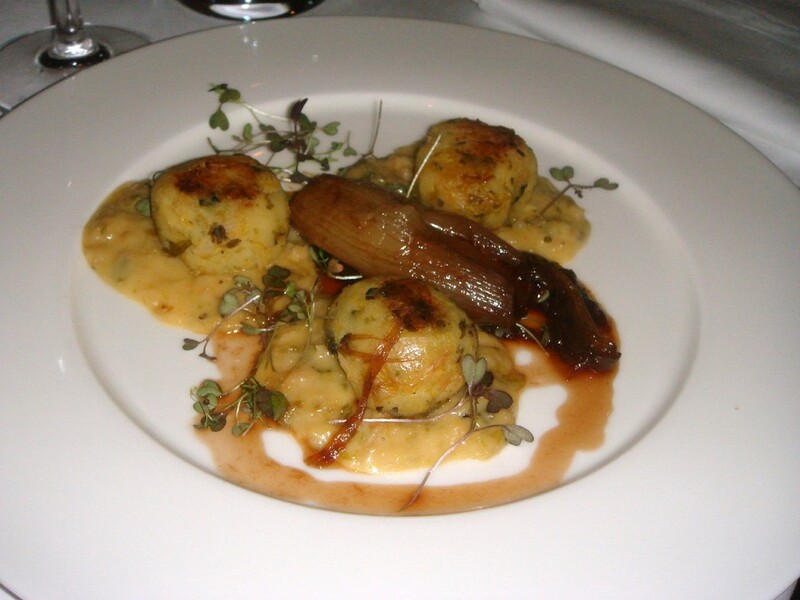 Bubble and squeak cakes with homemade brown sauce, vintage cheddar creamed cabbage and fried shallots were very tasty. The cakes were flavoursome and creamy, and they worked well with the slightly tart brown sauce. The cabbage was not too cheesy, and the shallots added further aroma to the dish. This was a really nice starter. 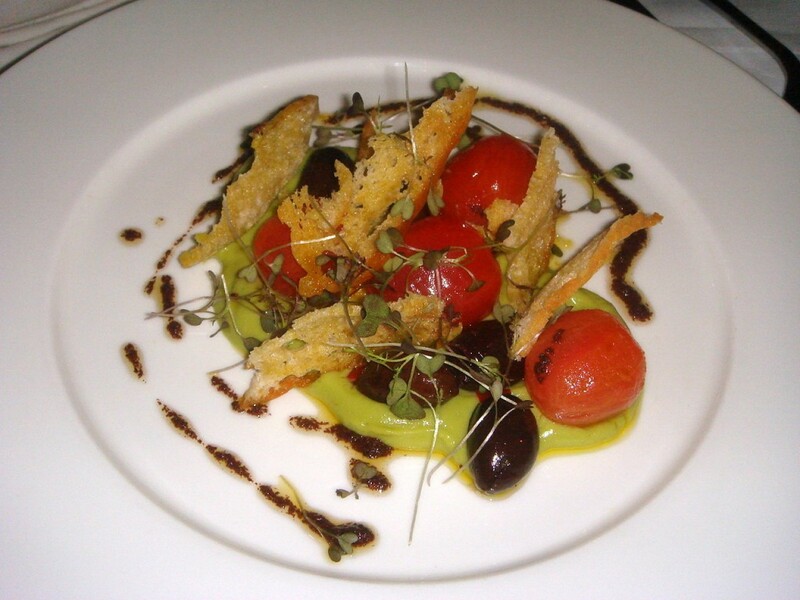 Another starter of candied chilli stuffed black olives with lemon and avocado cream, avocado oil, basil poached tomatoes and bread crisps was too acidic. The olives were also very briny, which along with the acidity overwhelmed the palate. As a result you couldn’t get a clear sense of the other flavours in the dish such as the avocado. This dish was a little disappointing. 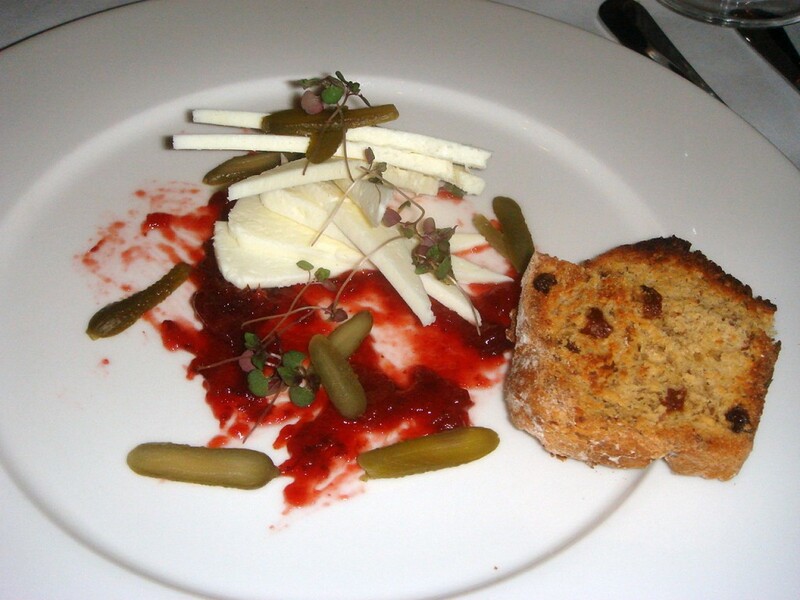 Yorkshire fine fettle (Yorkshire feta) and toasted fruit bread with plum and Malbec chutney and cornichons was very pleasant. The cheese was not too strong, and the bread was tasty, although I found this an odd option for a starter, since it was basically a cheese plate. To mains, and I went for the poached duck egg and Ribblesdale pudding (Ribblesdale cheese soufflé) with a hickory smoked potato croquette and pineapple pickle. This was well made, although again the pudding was a little too salty and difficult to finish due to the overseasoning. 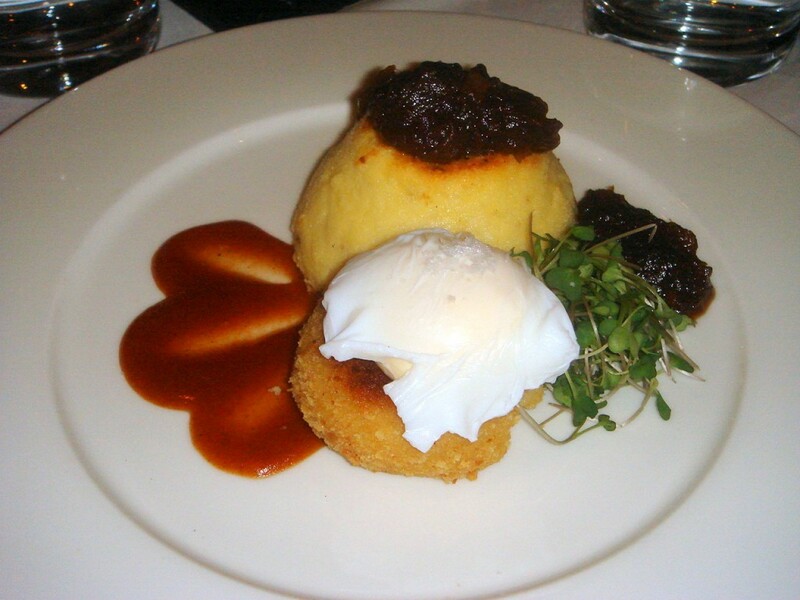 The egg with its runny centre was nicely cooked, and the croquette with its hickory smoked flavour worked a treat. A mushroom duxelle torte with Burgundy sauce, button onions and vegetables was delicious. The pastry was light and flaky, and the torte was generously filled with mushrooms. 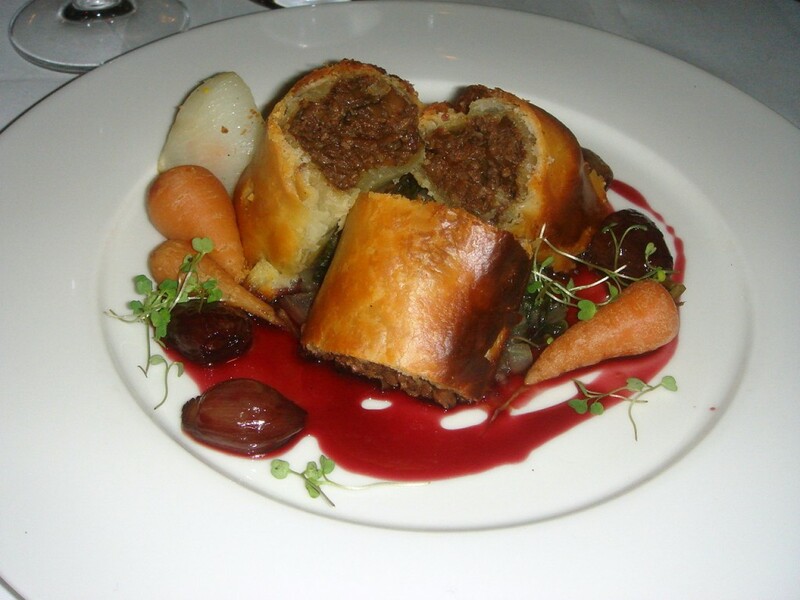 With its robust flavour, it was a rich, almost‘meaty’ dish. An organic Cropwell Bishop stilton terrine had a lovely smooth texture. It came with an apple purée which helped to cut the richness of the terrine, and there were some nice sides of roasted fennel and radish. Celeriac, sage and hazelnut dauphinoise with butternut squash, bergamot braised leeks and spinach puree was very appetitising. You got a clear sense of the flavour of each of the key components, eg, the celeriac and squash, which worked well together. Particularly pleasing was the bergamot in the leek which, while subtle, was very aromatic. Desserts included a treacle and apple pudding with a whipped bay leaf custard and homemade crunchy toffee; a Guanaja chocolate brioche with poached pear, Poire William ganache and salted walnut milk; and an olive oil and vanilla roasted pineapple with chilli syrup, mango purée and white chocolate ice cream. 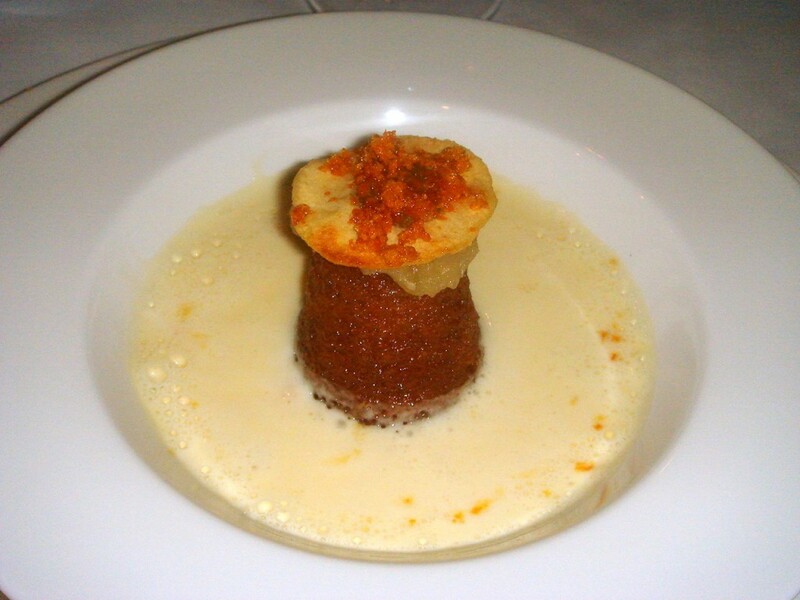 The best of the lot was the treacle pudding with its light and spongey texture and the creamy, but not too sweet, custard. This dessert was delicious and went down a treat. The brioche was pleasant with the salted walnut milk packing a nice punch, although the pineapple dessert was a little dull. The service was very warm and friendly. As for the dining room, it is a study in dim lighting, and as one of my friends suggested, a few candle lights on the table would have helped to create a slightly more intimate atmosphere. Otherwise, it’s very pleasant and nicely decorated with warm, dark colours. 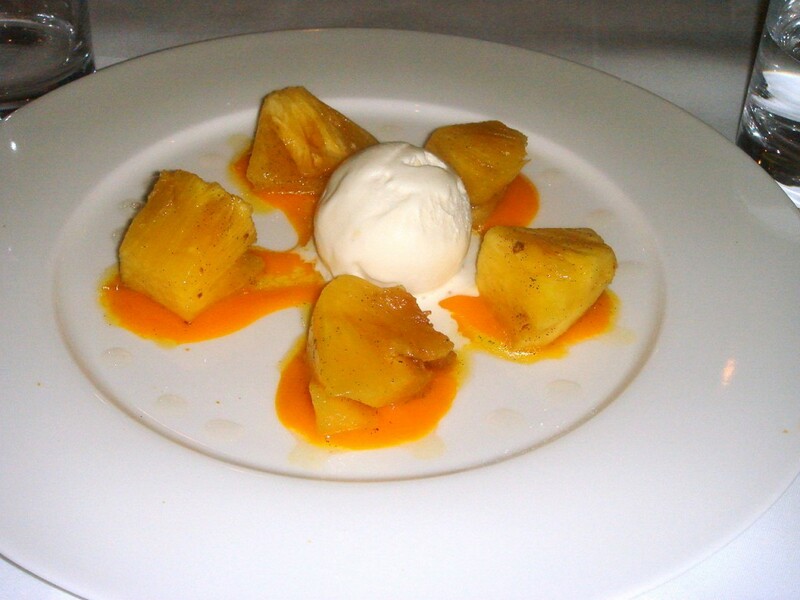 Vanilla Black did well to achieve lots of variety, not only in each of the dishes, but in the menu itself. 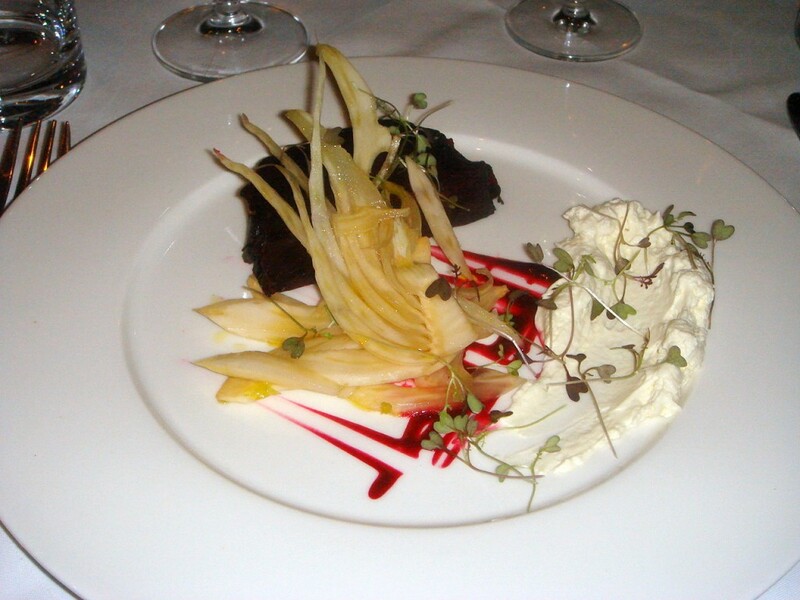 The food is well presented, very well balanced and what also impressed me was that the restaurant did not just rely heavily on the use of cream to generate flavour. And even though not all the dishes worked, the cooking was in general very good. But what let this meal down was that some of the items that we had were overseasoned. There were one too many instances of this to ignore, which was a shame because otherwise I would have thought this restaurant was very good. Prices: 2 course menu is £24, 3 course menu is £30. I went a couple of months ago, and totally agree with your analysis. I found the service to be lovely and warm, but the dishes were very oversalted to the point of being inedible. 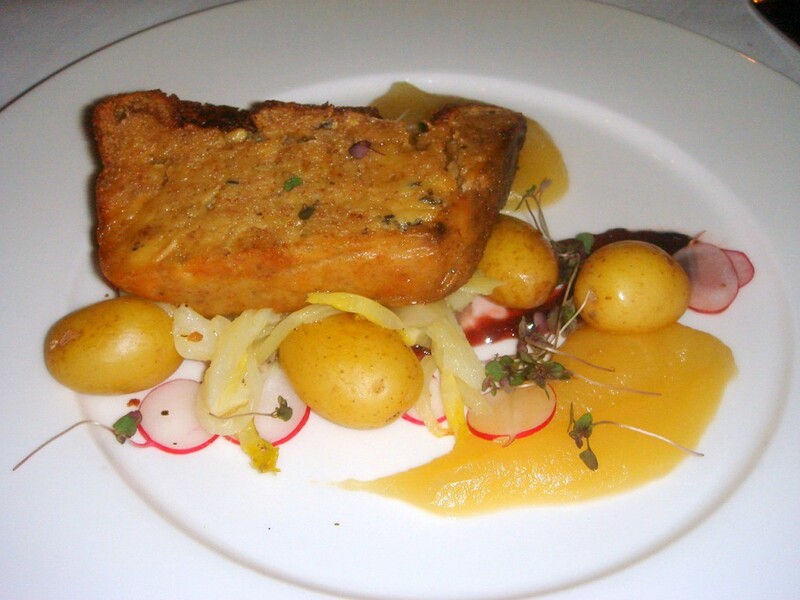 The terrine stands in my memory as a particular example. The kitchen put a lot of effort into the presentation, so accordingly dishes do look exceptionally interesting and entertaining, if quite busy. I do like the enthusiasm they put into their food, they just need to work a bit on the seasoning and it would be a very fine restaurant. Yes, they need to get that seasoning right. It’s a real shame, because the saltiness did ruin some of the food which would have otherwise been very good. I am curious as to what your vego friends thought of it – did they notice the weaknesses you pointed out as well or were they just very excited to actually be at a vego restaurant and not have to eat yet another mushroom risotto? 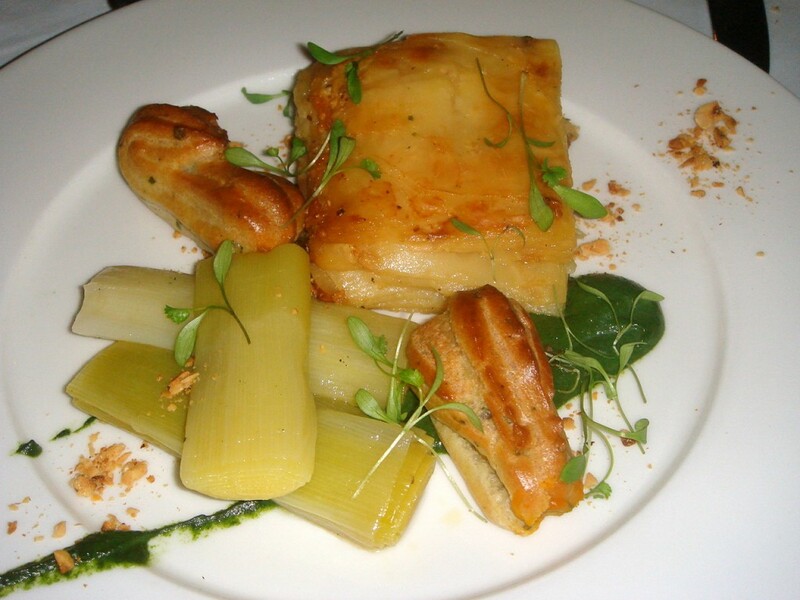 You’ve got to go to terre a terre in Brighton – the most sublime vegetarian restaurant in the land! 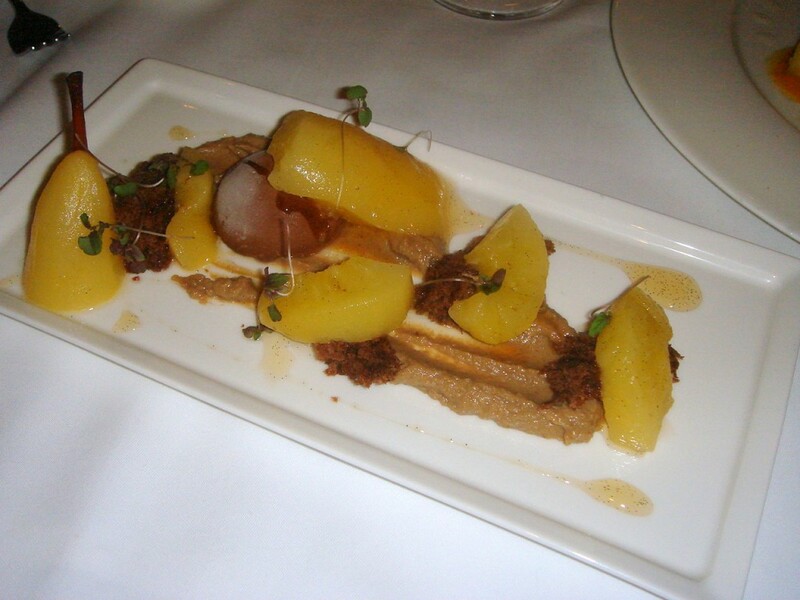 As a lifelong vegetarian, I love Vanilla Black and think its the best vegetarian restaurant London has to offer. The bit about overseasoning, I think it depends on each individual. I have been to Vanilla Black three times and was quite glad I didn’t have to ask for salt to add to my food. Whereas in other restaurants I find the food quite bland. Pity its a bit pricey for me otherwise I would go there every week! I agree with Katrina, Terre e Terre is a must for any veggie food lover!